The French town of Loos (Lōs) was the British contribution to a massive Allied offensive on the Western Front in the Fall of 1915. Masterminded by the French General-in-Chief Joffre, the offensive was intended both to draw German strength away from the reeling Russians and to pinch out the German salient (“the Noyon Bulge”) aimed at Paris. Launched with limited artillery support and using several raw New Army divisions, the ostensible aim of the British attack was to seize the German rail lines behind the front, but in reality was a diversion for the main French offensive in Champagne. 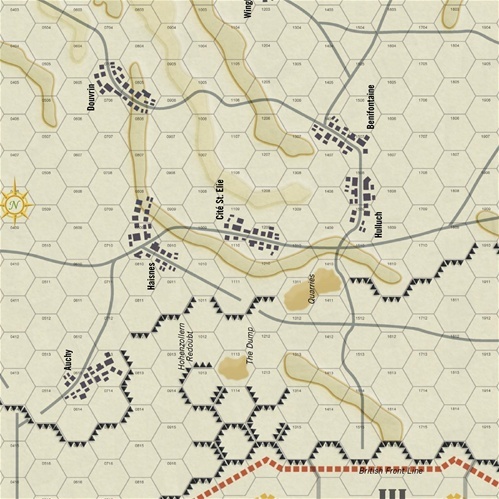 The British player, with a massive numerical superiority and heavy artillery support, must progress quickly. Powerful German reserves are nearby,and the battle becomes a race between the British advance and the German reaction. Loos uses a modification of the popular Fire & Movement game system. Developed to portray the mechanized battlefields of a later generation, F&M stresses the use of fire support to generate breakthroughs, followed by a rapid penetration by mobile reserves. 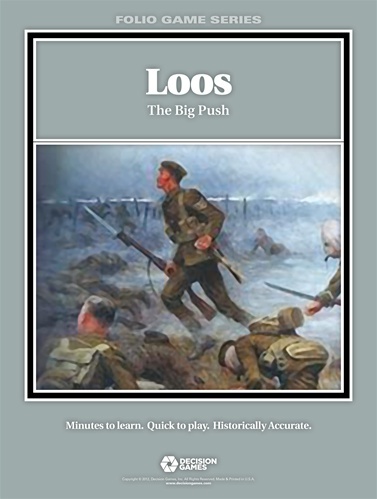 At Loos, no one moved faster than a man on foot, and fire support was clumsy, unreliable, and inflexible. Thus the strength of that support is variable and serves as a precursor to combat rather than an enhancement of it. 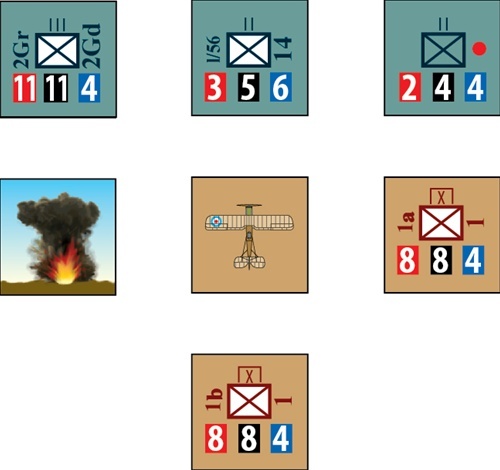 Exploitation is made only by units set aside for the purpose; they must be deployed behind (under) fighting units, and their subsequent movement is randomized. The fighting is attritional. The only way to avoid a stalemate is to mass troops and hammer away at an enemy sector until it breaks. Neither side has the forces to attack all along the line, so the location and direction of the attacks must be selected carefully. The player who makes the better choices will emerge the victor.